Notes: Rare cover double-postmarked in Washington DC where the World's Prime Meridian was established in 1884 at an International Conference. The above Royal Mail Greenwich Meridian stamps were issued on 26 June 1984 by Royal Mail and feature the following stamp designs: 16p Astronomy; 20 1/2 Navigation; 28p The Observatory; 31p Time. 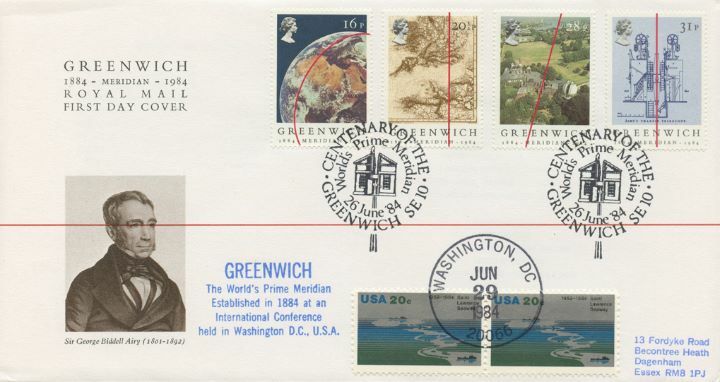 The Double Postmarked in Washington DC first day cover with the Greenwich, World's Prime Meridian, Special Handstamp postmark has been produced by Royal Mail/Post Office and features these stamps which can make a very collectible and lovely gift.